The prevailing meteorological conditions that influence the advection and diffusion of the atmosphere govern the distribution of atmospheric particles from its sources. The present study explores the spatiotemporal distribution of atmospheric aerosols over the Indian subcontinent (5°–40° N, 65°–100° E) and its dependence on the prevailing meteorological conditions. Eleven years (2002–2012) of Aerosol Optical Depth (AOD) obtained from the Moderate Resolution Imaging Spectroradiometer (MODIS) along with meteorological parameters extracted from reanalysis data are analysed at monthly timescales. Wind speed, wind divergence and planetary boundary layer height (PBLH) are studied as parameters for advection and diffusion of atmospheric aerosols. The result shows higher aerosol loading during the monsoon season with increased spatial variability. Wind speed and divergence correlate with AOD values both over land (R = 0.75) and ocean (R = 0.82) with increased aerosol loading at higher wind speeds, which are converging in nature. Owing to the varied climatology of the Indian subcontinent, land and ocean areas were classified into subregions. Analysis was carried out over these subregions to infer the influence of meteorological conditions on aerosol loading. Results are indicative of a distinct characteristic in the prevailing meteorological conditions that influence the distribution of certain aerosol types. 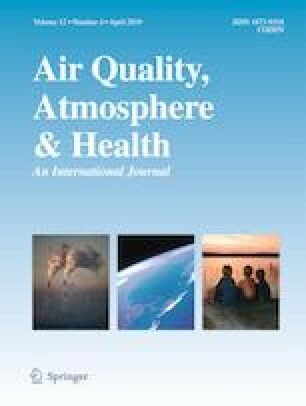 Further, the PBLH was analysed as an indicator of atmospheric diffusion to infer its importance in aerosol distribution. The results indicate that PBLH explains almost 30 to 90% of the total variance in AOD over the subregions which is particularly evident during the winter and pre-monsoon seasons. The online version of this article ( https://doi.org/10.1007/s11869-019-00677-w) contains supplementary material, which is available to authorized users. The authors would like to thank the Department of Applied Mechanics and Hydraulics, NITK Surathkal, for providing necessary support during the study. The authors gratefully acknowledge the NOAA Air Resources Laboratory for the provision of the HYSPLIT transport and dispersion model and/or READY website (http://www.ready.noaa.gov) used in this publication.